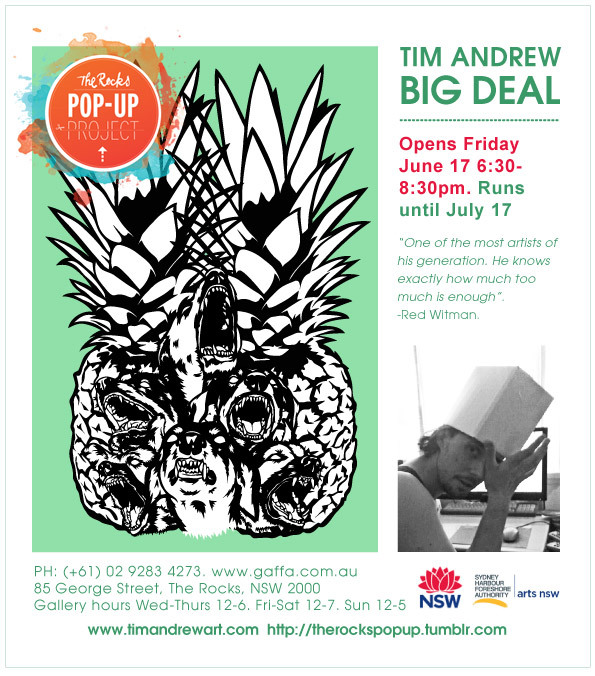 Gaffa gallery have approached my pal Tim Andrew to do a re-launch of his exhibition Big Deal in a pop-up location down at The Rocks in Sydney. I was fortunate enough to get along to the debut of Big Deal a few months back at Gaffa and I highly recommend you get along to this show. Featured will be a bold mix of Tim’s graphic two dimensional work, including his signature colour palette and brilliant (and maybe a tad disturbing to some) sculptural pieces. I personally loved the pineapple’s and Kujo’s piece, as per the flyer below, go check it out for yourself. 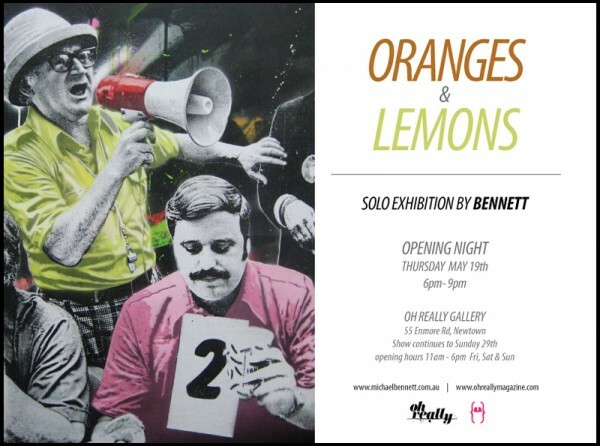 On the back of winning the Absolute Stairwell Gallery’s Peoples Choice auction and recently participating in the Adidas ‘All in Challenge’, BENNETT announces his solo show ‘ORANGES & LEMONS’. The concept behind the show’s title is derived from a well known children’s nursery rhyme and is set to challenge the way we perceive images, from the way they are “meant” to be been viewed. 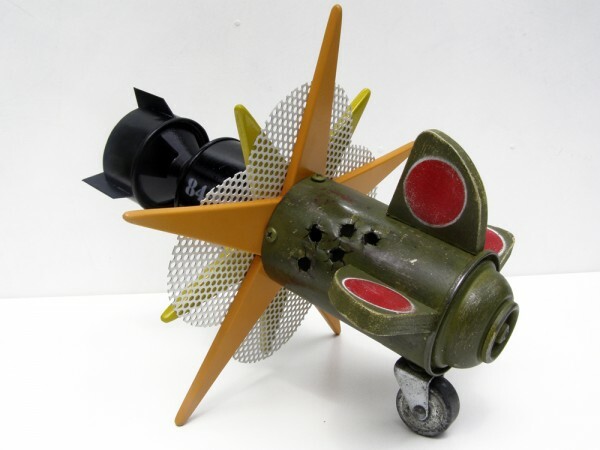 Working in mixed media, acrylic and aerosols, BENNETT’s work is often laiden with controversial and sometimes shocking commentary. 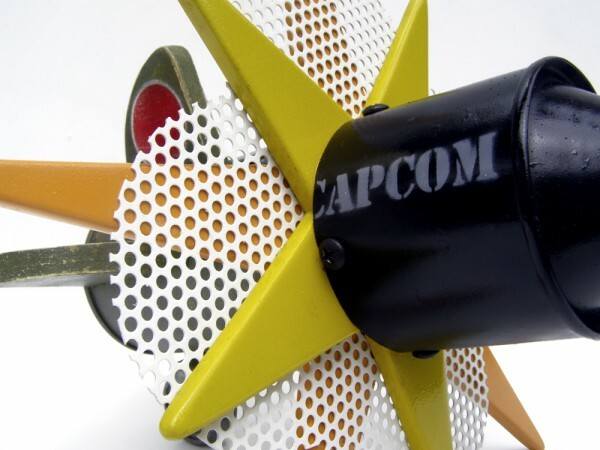 He re-contextualises common, mass-produced objects and themes within the layers of his mashed up styled pieces. The result although entertaining to the audience, ultimately challenges viewers to draw upon their own conclusions from the numerous narratives and scenarios in which they are faced. BENNETT currently works out of Sydney’s StupidKrap studios. 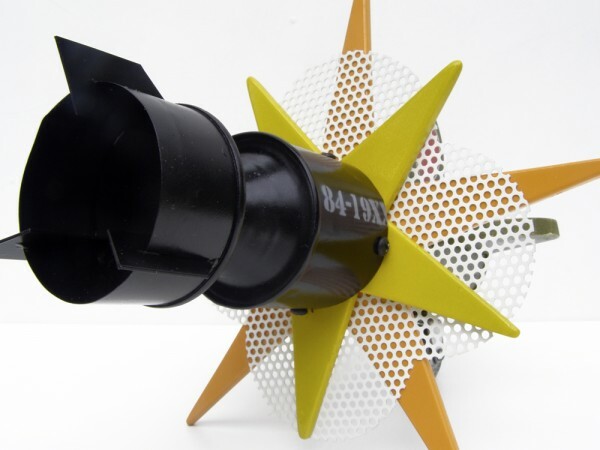 “ORANGES AND LEMONS” opens Thursday May 19th at 6pm. 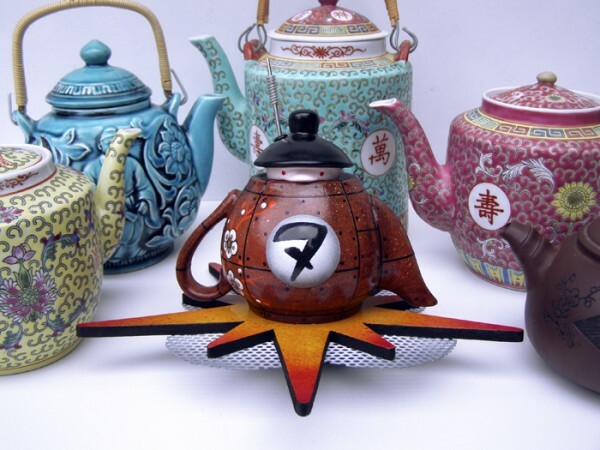 Fifty fist-sized teapots have met their fate at the skilled hands of a select group of established and emerging artists. With the fabulously diverse line-up consisting of painters, print makers, photographers, graphic designers, typographers, digital, textile, and street artists, there’s sure to be eye candy to satisfy any sweet tooth. Bec Winnel, Burntfeather, Jessica Klingelfuss, Nicole Tattersall, Aramas Ridge, Sam Octigan, C…aitlin Shearer, Alex Louisa, TEZ, Jessica Singh, Emma Kidd, Rebecca Murphy, Kaitlin Beckett, Gimiks Born, Caitlin Rigby, Ellen Stapleton, Jordan Clarke, Flossy P, Mz Katii, The Bold Italics, Kat White, Tabitha Emma, Ben Zen, Qwux, I & The Others, Tony Curran, Tiger, Eirian Chapman, Lizzie Hall, Michelle Dawson, Andros, Gloz, Ian Mutch, Bronek Kozka, Sarah Holmes, Laura Carey, Jacque Prior, Kirbee Lawler, OKAY, Hannah Fenton, Kirst Ohh, Anna Mae Marquez, Yasemin Sabuncu, A.West, Beth Josey, Matthew Roland Bannister, and a few more super secret surprise artists – all fabulous Australian talents! Everyone is welcome to attend the exhibition opening night on April 13th, 6-8pm, at Paper Plane Gallery in Rozelle, Sydney. There will be free refreshments including beers, delicious hot and cold teas, and nibbles etc served throughout the evening. These tempting teapots will be on show until May 1st. 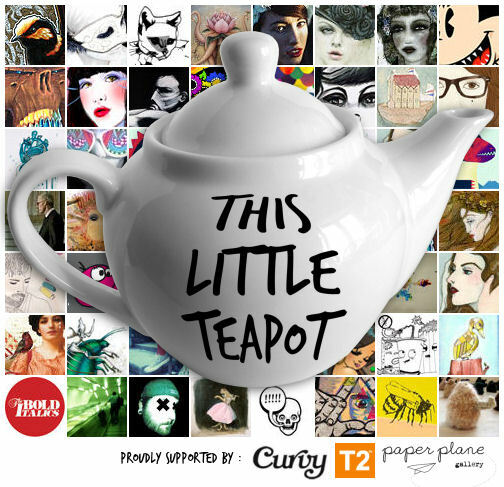 Proudly supported by T2, Curvy, and Paper Plane Gallery. Villain puts on a show to round up the year, featuring a massive lineup of artists customising everything from Munnys, Teddy Troopers and Coin Ups to a blank by Melbournes’ own Mad Scientist of low brow Claudio Mantuano. 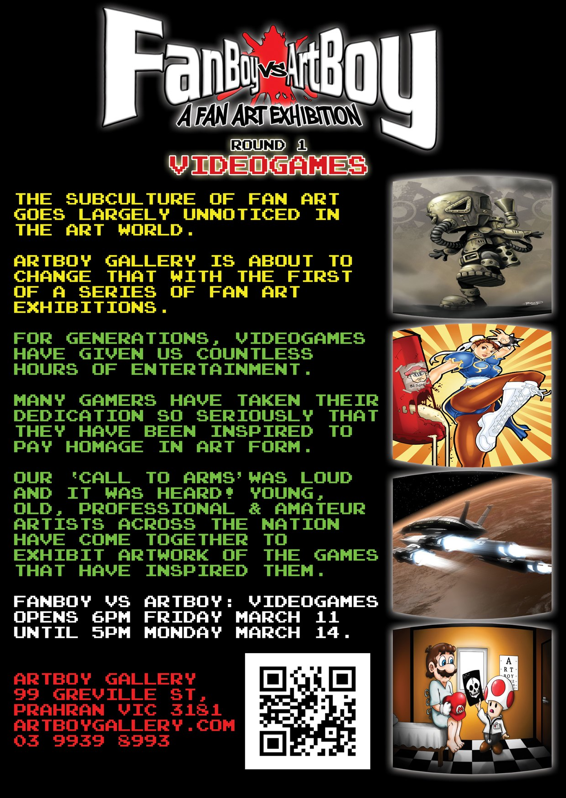 As well as all the custom toy goodies there will be artwork and prints by many of the artists.